Party like a Founding Father! As soon as colonists set foot on American soil, they started building taverns and pubs, and they've been an important piece of American history ever since. In the early colonial days, they were meeting places, restaurants, social clubs, post offices, and much more--you could even say that the idea for independence was born in American taverns. Patriots during the Stamp Act days would meet to enjoy a flagon of ale and talk treason--and some bars even hosted Founding Fathers. Some of these historic taverns are still open to this day! 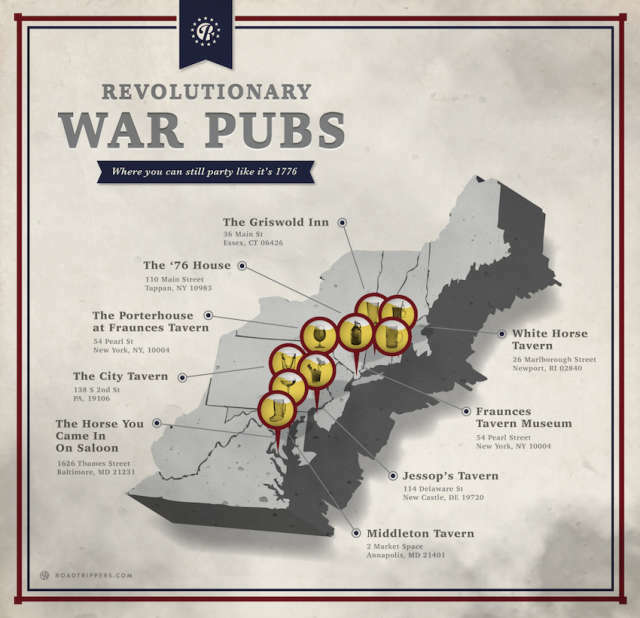 Party like Sam Adams (I don't want to jump to conclusions here, but the man does have a beer named after him) and toast to freedom at one of these Revolution-era pubs! The White Horse Tavern in Newport, Rhode Island has been serving fresh seafood and cold beverages to Americans since 1673. In the early 18th century, it served as the meeting place of the Colony's General Assembly, Criminal Court, and City Court (ah, the good old days, when laws could be made and criminals could be convicted in a bar). The proprietor in 1776 actually left the place temporarily during the war so he and his family wouldn't have to live with the Hessian mercenaries quartered there. But just because the tavern's 350 years old doesn't mean it hasn't kept up with the times--it supports Rhode Island's growing foodie scene by using fresh, local, artisan ingredients whenever possible! The Griswold Inn has been putting up and feeding sailors and overland travelers since 1776. If you want to dine like it's 1776, then check out the historic dining menu, which features classic dishes that would have been served back in the day. Or, just sit down for a drink at the tap room--it used to be a schoolhouse, but it's been put to much better use. They've also got a general store, and you can still book a room at the Inn-- don't worry, they aren't currently billeting any redcoats in the Essex, Connecticut drinkery. When you see the old-school American flag hanging outside The '76 House in Tappan, New York, there's no doubt that you've reached the right place. This pub, which was once known as Mabie's Inn, played a major role in the Revolution. Not only did George Washington dine here, but it was also used as a makeshift jail for captured British spy Major John Andre, who conspired with famed turncoat Benedict Arnold, before he was hanged. Gruesome! Most history nerds will remember that Founding Father/then Vice President Aaron Burr shot and killed fellow Founding Father Alexander Hamilton during a duel-- the two had long held differing political stances, and accusations of slander reached a boiling point in 1804. That fateful duel took place just outside New York City, at the Weehawken Dueling Grounds on July 11th of that year. Even though the exact site of the Aaron Burr-Alexander Hamilton Duel now lies below a set of railroad tracks, a monument to the Weehawken Dueling Grounds is located in a park close by. A plaque is affixed to a boulder where a mortally-wounded Hamilton allegedly rested after being shot, and a bust of Hamilton can be found on a nearby pillar. As for Burr, his political career was damaged beyond repair when he was tried (and found not guilty) of treason shortly after the duel... although he was allowed to finish serving his term as Vice President. Fraunces Tavern operated as a bar from 1762 until the early 20th century (except for a brief period post-Revolution when it housed offices for the Departments of Foreign Affairs, War, and Treasury). It was a meeting place for New York's Sons of Liberty, and it was the site of Washington's 1783 farewell address to his officers after the war was won. Today, it's a museum dedicated to American Revolution history in New York-- but if you're in search of booze (and why shouldn't you be? This is America), head next door to The Porterhouse at Fraunces and choose a drink from one of the largest selections of craft beer in the city. The Old Stone House, located in Brooklyn's Washington Park, is a reconstructed 1699 Dutch farmhouse that played a major role in the Battle of Brooklyn during the Revolution. Today, it's a museum dedicated to New York's role in the war and life in Colonial New York. Exhibits, documents, programs, tours, and more provide an in-depth look at Brooklyn's early history! The National Constitution Center in Philadelphia is a museum entirely dedicated to the Constitution-- and since the Constitution is the document that lays out the entire framework of our country, it's a great, interactive way to learn more about it. In addition to lessons on the Constitution, you'll see one of the original 13 copies of the Bill of Rights, bronze statues of Constitution signers, and several rotating exhibits. Pro tip: admission after 4pm is $5 instead of $14. When they weren't drinking, the Founding Fathers could be found debating and adopting the Declaration of Independence and, several years later, the Constitution (following the ill-fated Articles of Confederation, of course) at Philadelphia's Independence Hall. Today, you can tour this important piece of history and literally stand where the Founding Fathers stood, in the very spot where America was born... and once you see how hot and stuffy the rooms can get, you'll probably need a drink after the tour, too. Pro tip: It's free to tour! Book tickets online in advance, since it's a popular attraction. The City Tavern is a Philadelphia establishment that was founded in 1773--just in time for the Continental Congress (and a boatload of Founding Fathers) to roll into town. The Congress unofficially met here in 1774, and in 1777 the delegates celebrated the first anniversary of the Declaration of Independence here. The Tavern endured some early American scandal as well. Even though it played host to the Continental Congress, the owner actually ended up being a British sympathizer and left town when the British shipped out. Who would have guessed? As if you needed another reminder why our forefathers drank so heavily, you can stop by Valley Forge National Historic Park, where George Washington and the American Army spent a famously rough winter with barely enough food and clothes to go around. The visitor center has a museum with artifacts from the winter of 1777, and you can also find historic buildings, re-enactments, memorials, and tons more Colonial history here. Is there anything more colonial than sitting by the fireplace and enjoying a beer while digging into a hearty pot pie and finishing the meal off with some classic cobbler? I think not. Jessop's Tavern takes the colonial theme seriously-- the menu is referred to as the "Bill of Fare" and all the servers dress in traditional garb. New Castle is known for its historic charm (Jessop's was built in 1674!) so exploring the whole town is a must for history geeks. The Horse You Came In On Saloon, despite its mouthful of a name, has seen (and survived) it all: the British, the War of 1812 (the British didn't learn their lesson after the Revolution, apparently), Prohibition... It even predates the city of Baltimore itself, having been established in 1775! It's had a long and storied history, but it is, without doubt, most famous for being the last known place Edgar Allan Poe visited before his mysterious and untimely death. Nevermore! The Maryland State Capitol is the oldest state house building in continuous legislative use: construction started in 1772, although the building wasn't completed until 1797, thanks to the ongoing Revolution. It features the largest wooden dome to be built without nails in the country, and is topped with a lightning rod that was supervised by the inventor of the lightning rod himself: Founding Father Ben Franklin! Seriously, what prominent early American leader didn't enjoy a drink and a bowl of chowder at the Middleton Tavern? George Washington, Ben Franklin, Tom Jefferson, James Madison...and those are just the really famous names! Its prime location right near the ferry docks made it a popular destination for sailors and travelers alike, and since the Freemasons, the esteemed Tuesday Club, and the Maryland Jockey Club met there, it was a hotspot for the state's most important gentlemen. Nowadays, locals flock to this tavern to enjoy Maryland staples of fresh crab cakes and oysters.